The Ashram encouraged people to resist exploitation, and, for this, it initiated activities in the fields of education, health, agriculture and forest-based village industries on a small scale. At present, the Ashram has nine major programmes (departments): Women's Empowerment, Education, Khadi and Village Industry, Agriculture, Animal Husbandry, Health, Environment, Support to Other Volunteer Groups, Gram Nirman or Village Development. 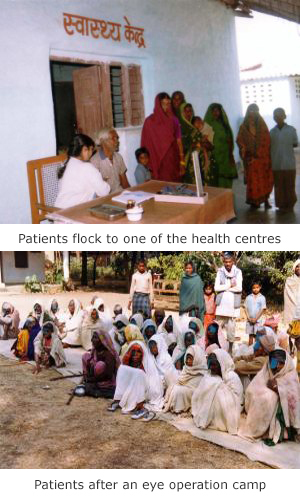 The Ashram centre trains village health workers for its own health programme and also selected workers of small voluntary organisations. It produces learning material like posters, folders and booklets to facilitate health education. The experience over the past decades has made it clear that the newly emerging diseases are difficult to control at individual level. The society will have to consider changes taking place in its own environment, the genesis of new ailments, understand norms of development and bring change in it to develop a healthy life style. This is a special concern in the context of health education. Banwasi Seva Ashram started its education programme with awareness generation. In 1967-68, an adult literacy programme along with mobile library programme was added. Child education programmes started in 1968 with the establishment of a school. Non-formal education was started in 1977 for school deprived working children. A total literacy campaign was started in 1990 and three years later, children science congress and life education programmes were added. In the period 1990-96, the total literacy campaign covered 212 villages. The total literacy campaign entailed literacy of women and men and also the continued education of literates through Jan Shikshan Nilayam's. The regularisation of government schools and involvement of women leaders to enrol children, especially girls, in schools - between 1990 and 1993 - increased the success. As a result, the literacy level in Total Literacy Programme villages increased to 75.46 per cent and people's interest in children's education increased. Banwasi Seva Ashram was designated to run the District Resource Centre as part of the Total Literacy Campaign, for preparing appropriate literature and training the personnel. BSA runs a high school on its premises. There are five junior high schools and one primary school at Village Development Centres. Students of these education centres have participated in national events of Children's Science Congress and one girl student in an international event. Accreditation by the Children's Science Congress has helped promote a scientific attitude among students and teachers. The Ashram has three hostels for boys and girls at three different places: Ashram premises, Turra and Duddhi Nagar. The inmates bear their expenses. The infrastructure cost is borne by the Ashram. The Ashram organises 13-15 life and prevailing situation orientation camps for adolescent girls as well as boys of the 14-20 years' age group (students and non-students), for promoting an understanding among the new generation. As compared to earlier days, parents have become aware of the significance of children's education. The government schools are being regularised. Some other organisations also run schools. But still there are several places without educational facilities. 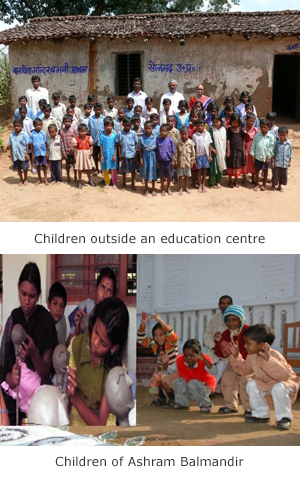 The Ashram thinks of running new educational centres on a beneficiary contribution basis. Thanks to efforts of Banwasi Seva Ashram, crops like tomato have been introduced in south Sonbhadra. The Ashram conducted various experiments in the production of grains, vegetables, fodder, gardening, and forestry, on its premises. The experiments which were successful were then extended to the villages. In the beginning, emphasis was on using compost along with fertilisers, but since some years, on using compost instead of use of fertilisers. The Ashram promotes use of cow urine as fertiliser. Now indigenous herbs are being used as insecticides. This knowledge is communicated to people in special camps held at Village Development Centres. Village women leaders - the Gram Sakhi's - communicate the messages during their programmes of home visits. Demonstrations on the topics are also held during orientation training camps, orientation of adolescents and youths and of other village functionaries. The Ashram has planted fruits like banana, sugarcane, lemon, guava, mango, grape and peach. Success in raising these crops on land full of stones was a morale booster for us and a new experience for horticulture officials. Later the Ashram started raising a nursery of fruit plants. Saplings were distributed and also sold. Several villagers pooled in money and planted saplings. Now fruit trees can be seen in homes. Some villagers also sell fruits in the market. The Ashram has raised forest on 35 acres of its land and motivates the farmers to plant trees on the boundaries of their fields. Several people have also taken initiatives for intensive plantation on their unproductive lands. Apart from plantation, the Ashram has also motivated farmers to protect village forest, with varying success. A nursery has also been set up as a part of wasteland development activity in Ashram farms. Later several villagers were trained in raising a nursery. Meeting all the requirements of life on the basis of agriculture is not possible for small farmers and they need complementary sources of income. Village industries offer full possibilities in this regard. 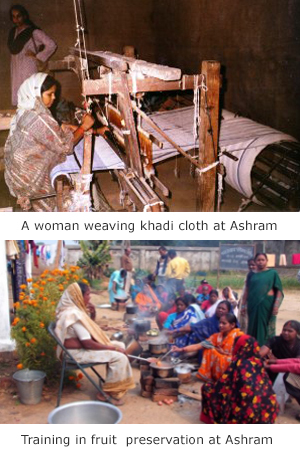 In this context, in order to improve the economic status of small farmers, the Ashram initiated khadi and village development related activities in 1979, with support from the Khadi and Village Industries Commission. The Ashram also ventured in harvesting minor forest produce that had good employment potential. Spinning and weaving of cotton/silk cloth and woolen (blankets) at Ashram and village centres. In the past few years, the Ashram has made an effort to establish a continuing dialogue with the craftsmen, for understanding their constraints and for finding solutions to these. Karigar Sansthan was formed with the purpose of resolving the problems, aiming at upgradation of skills and representation at government level. A facility centre for craftsmen wass also started and it has extended its services to a few remote points, to facilitate the work of craftsmen. The relations with other Gandhian Institutions and other voluntary organisations with common interests are intense, with mutual exchange of knowhow, training facilities for villagers, many forms of support for product sales, etc. Increasing entrepreneurship and employment potentials were the need of the hour when the Ashram started implementing whole village development programmes and these are still as relevant even today. To address the unemployment situation, the Ashram runs employment oriented training in agriculture, animal husbandry, tailoring, electric fitting, diesel pump mechanics, etc. It also trains social workers, veterinarians, health workers, etc. The Ashram has experienced workers who manage various activities and on the basis of this resource, the Ashram started apprentice trainings in various skills, including social work, for the development of the villagers. This has been very beneficial for the community. For this, experts are consulted from time to time, students are sent to different places for observation and learning, special trainings are also organised from time to time. The process has been successful. About 3000 persons are beneficiaries. Most of them are settled in life, some are training others in turn, some have joined service or are using their skills acquired by training for generating additional income. These results and the opening of an industrial training institute have reduced the inflow of aspiring candidates at Ashram. Yet, even now there are always a few apprentice trainees. Voluntary service groups also take advantage of the facilities.